What is David Faulkner doing? A question he has asked himself a lot at the moment! David’s motivation came from a David Attenborough documentary that he watched when he was little; he recalls that David Attenborough told a story of filming orangutans in Borneo and how the film crew had their boat stolen by an ‘orange pirate’. The orangutan had studied their movements for weeks before finally deciding to procure the boat! In 2007 David Faulkner made his first visit to the famous Sepilok Orangutan Rehabilitation Centre, where he left amazed and inspired to do something positive to help. 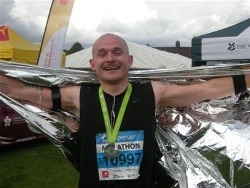 David purchased some running trainers in 2009 and set himself a goal of running the Nottingham marathon. On September 2010, in 3 hours 40 minutes, David had done something that he could really be proud of for a species that needed support. He raised over £500 in fundraising for Orangutan Appeal UK, but more importantly he raised awareness, amongst friends, family and frankly anyone who was prepared to listen to him! So what could David do to better that effort? Well, this bit is Eddie Izzards fault… “I thought if I can run 1 marathon, then surely I can run 6 in 6 days?” - David Faulkner stated in our most recent newsletter. The route will take David from Worcester to the Durrell Wildlife Conservation Trust orangutan enclosure in Jersey. His penultimate marathon will end at the Orangutan Appeal UK administration office in Brockenhurst and we cannot wait to celebrate this epic challenge with him!